Winners of the 2017 UCLA Library Prize for Undergraduate Research! Congratulations to this year's winners of the 2017 UCLA Library Prize for Undergraduate Research! 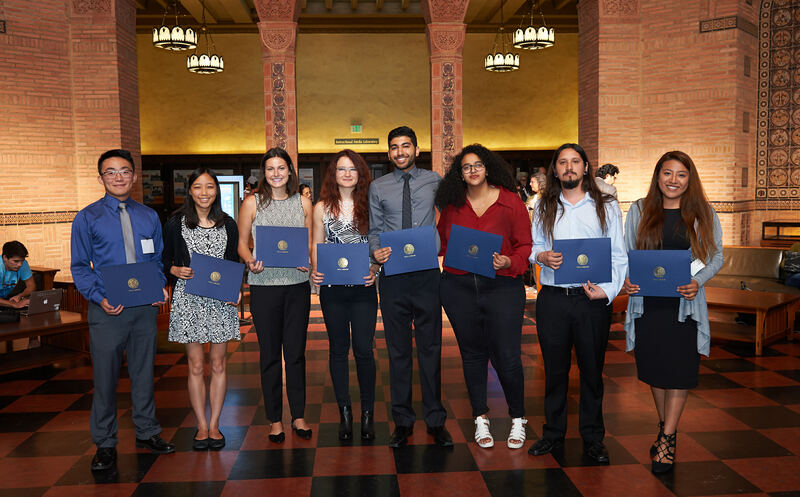 This prestigious award recognizes and honors excellence in undergraduate research at UCLA, as exemplified through the thoughtful use of library collections in the creation of an outstanding research project or paper. The prizes were awarded in two categories, and winners received cash prizes ranging from $350-$700. Winners were chosen by a panel of librarians and faculty. Its inspiration comes from Ruth Simon, BA '58, a lover of books and libraries. Guided by her passion for reading and research and wishing to share her devotion to libraries, Simon established the Ruth Simon Library Prize for Undergraduate Research, the first endowment of its kind at UCLA. Its goal is to inspire and reward UCLA undergraduates for conducting outstanding library research now and for generations to come. Winning projects will soon be posted on eScholarship, the UC’s open-access digital publishing platform. "Raiding and Foraging Behavior of Megaponera analis in the Dja Biosphere Reserve of Cameroon"
"The New Pro-Choice: Legalizing Assisted Suicide"
"Canine Crackdown: Unreliable Drug Sniffs Threaten Civil Liberties and Equal Law Enforcement"
"From Nobiin to Rutana: The Role of Arabization In Creating Sudanese Language Ideologies"
"Precarity and Liminality among Jornaleros in Southern California: Structural Vulnerability, Porous Spaces and the Struggle for Being"
"Chicanxs and Medicine: A History of Ailments"